The Seattle Chill | Travel Musings • Yummy Insights • Join me on my tasty journey! I welcome October’s imminent chill each year. Contrary to popular belief, we receive a healthy dose of sunshine during the summer months in Seattle (maybe this is a stretch – should I say we usually receive this?!). Regardless, after long summer months filled with crisp blue skies, my classically-tan arms seem to yearn for something less warm. It’s at this time – during the long, warm days of August – I embrace my inner-giddiness in outwardly welcoming fall’s crisp mornings and sloggy afternoons. Perhaps it’s the changes I see in my environment that lead me to this love of fall: sun-scorched lawns find renewed green. 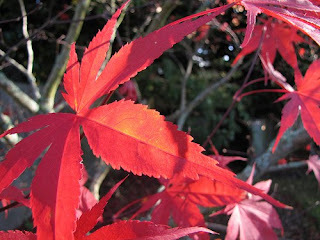 Brilliant green vine maples begin their subtle transition to surreal reds. Birds whose chirping seems to wane after summer’s endless sun, re-emerge to party in fall’s crisp air. I, on the other hand, happily shiver while walking (still sans jacket) to my morning bus stop, but with a secret smile of satisfaction in knowing that the afternoon home-bound walk will likely bring temperatures needing not a wrap nor a peeling of layers. I love fall’s perfection! Seattle itself hosts such an abundance of parks and greenbelts to enjoy fall’s color. Unlike other cities and states where falls colors brings swarms of visitors, Seattle (and the northwest) are more subtle in their ‘advertising’. Perhaps the colors and beauty aren’t shouted from every mountaintop, but they remain yet another Seattle surprise. A drive through the Washington Park Arboretum on the city’s eastern flank may not be the rolling hills of Vermont, but stop – park – and walk through this in-city gem and gawk at alder, hemlock, Japanese maple and mountain ash with more variety and color than a full set of crayolas. Continue out the northern end of the park and wind your way around to the campus of the University of Washington where century-old maples frame well-rounded architectural styles. Wander the southeast corner (north of the Evergreen Point Floating Bridge) behind the Museum of History of Industry to take in various ground-hugging northwest varietals while walking Marsh Island’s planks and boardwalks. (Watch for the occasional log-laying turtle absorbing last bits of the season’s sun for their long, cool winter). Neighborhoods north of the campus bring you through winding neighborhood roads nestled in trees-aflame (offset beautifully by local coniferous evergreens). Haven’t had enough? Go west! West to Discovery Park, that is. This 520+ acre wilderness park (within the city’s limits) boasts alder, hemlock, salal, vine maple and ash that’ll literally knock your socks off come fall-color time. Park at the visitor center and walk the miles of hiking trails within the park (not to mention over 75 varieties of birds making the park their home!). While the city and it’s surrounds offer an abundance of fall color, if you’re looking for more you needn’t head out of the northwest. My favorite drive? A portion of the ‘Cascade Loop’ heading due-east into the Cascade Mountains. Begin your drive heading east on Hwy 2 – winding through charming towns and rural farmlands, you’ll find yourself gaining elevation as you climb Stevens Pass. The mountainsides are ablaze with chartreuse and crimson huckleberry bushes, sprinkled with a contrasting dose of vine maple. While miles from Seattle, within a few hours you’ll find yourself on the eastern slopes of the Cascades ready to be welcomed by the charming, Bavarian town of Leavenworth. Stop for lunch, or continue to the highway 97 cutoff for more mountains and color on Blewett Pass (beginning to circle-back to return to Seattle). Larch and sub-alpine are abundant on this 4,000+ foot mountain pass. Continue the loop through open rangelands flanked by high peaks and thick evergreen forests while returning to the city via Interstate 90. Small towns, each worth a stop for varying reasons, dot the highway before winding up 3,000-foot Snoqualmie Pass before the 45-minute cruise back into the city. Embrace the changes in and around our city as Fall is finally upon us. One Response to "The Seattle Chill"
Hey Seattle Maven, I am one of your Twitter Followers both as @serpentifa and @amazinglyamara , I love your idea of getting out and viewing nature during this beautiful time in Seattle… so far today the husband and I have been reluctant to leave bed, as it is cold. Now I am charged up to put on my cute winter hat, get the camera, and enjoy fall in the best city on earth.